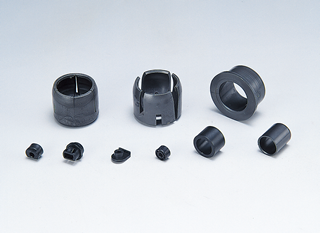 The Oiles 81 series are self-lubricating bearings made of polyolefin with lubricating oil and special filler distributed uniformly in plastic. They are available in various grades. ■ Serviceable without the need for lubrication. ■ Features low coefficient of friction and superior impact resistance performance. ■ Demonstrates superior wear resistance in abrasive conditions due to foreign matter, coarse surfaces of mating parts, rust, etc. ■ Injection-molded and can be made in complicated shapes. Has good mass productivity. For detailed product specifications, check with the electronic catalog. It is written the service range, the test data, and the standard size table, etc. * Membership registration is required for use. For inquiries or to request a catalog, click here!